Working in conjunction with the Saudi Commission for Tourism and Antiquities, researchers from the University of Oxford have discovered two pieces of a tusk that when combined measure six feet in length. 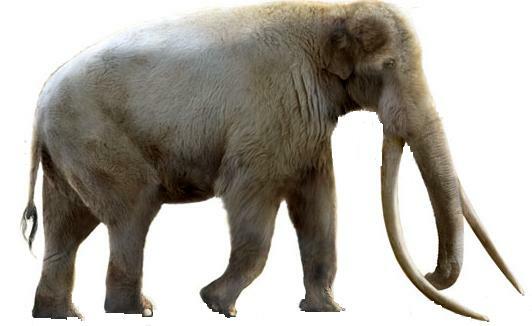 The researchers believe it is from a Palaeoloxodon or a "straight tusked elephant". An elephant's carpal bone was recovered in a separate study done by a Swiss team in the Nefud Desert just five meters away. The sand layer dates back to approximately 325,000 years and the elephant is believed to be of the same age. These finds are among the first to be discovered at the site since excavations started in 2013. The researchers say the finds are hugely significant because they suggest that in order to support the life of big beasts, today's arid terrain was much wetter and greener in the past. Project leader Professor Mike Petraglia, from the School of Archaeology at the University of Oxford, said: 'The discovery of the elephant tusk is significant in demonstrating just how much the climate could have changed in the Arabian Desert. Elephants would need huge quantities of roots, grasses, fruit and bark to survive and they would have consumed plenty of water too. The findings were revealed at the Green Arabia conference at Oxford University, at which scientists are examining the latest evidence on how early humans and animals are likely to have been affected by past climate change in the Arabian Peninsula. Attending the opening of the conference was HRH Prince Sultan bin Salman, Secretary General of the SCTA. He and Professor Ali Ghabban, Head of Antiquities at SCTA, have supported the project by approving the archaeological work undertaken by the research team. As a starting point for the research, the team analyzed satellite imagery, which reveals a network of ancient rivers and lakebeds in the Arabian Peninsula. Using this photographic evidence, they selected sites near ancient water sources for their excavation work, as these sites are where animals and early humans are likely to have gathered. From the size of the carpal bone, the researchers have made initial conservative estimates on the body size of the elephant and believe it came from an individual that weighed 6000-7000kg and stood over 3.6m at the shoulder. A living African elephant weighs between 3000-6000kg, with males averaging around 3.3m at the shoulder. Researchers were able to identify the genus by comparing the bones of the feet with museum collections elsewhere. Read more at the University of Oxford. Palaeoloxodon antiquus image via wikia.